Viliame Rarasea leasves Ian West-Stevens and Troy Butcher in a tangle as he breaks downfield. 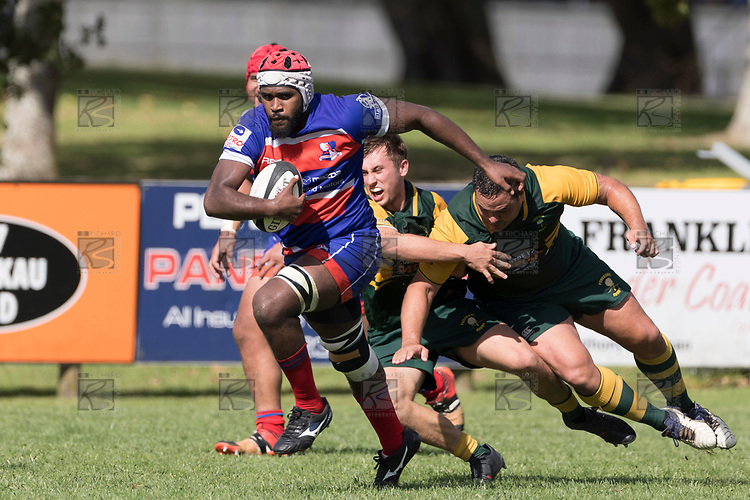 Counties Manukau Premier Counties Power Game of the Week Club Rugby Round 4 game between Pukekohe and Ardmore Marist, played at Colin Lawrie Fields Pukekohe on Friday March 30th 2018. Ardmore Marist won the game 27 - 21 after leading 13 - 11 at halftime. Pukekohe Mitre 10 Mega 21 -Trent White, Samu Pailegutu tries, Sione Fifita conversion, Sione Fifita 2, Vilitati Sabani penalties. Ardmore Marist South Auckland Motors 27 - Katetistoti Nginingini, Karl Ropati, Alefosio Tapili tries, Latiume Fosita 3 conversions, Latiume Fosita 2 penalties.